The artwork for this set comes primarily from my own scans and photos, as well as from Axel Giménez. 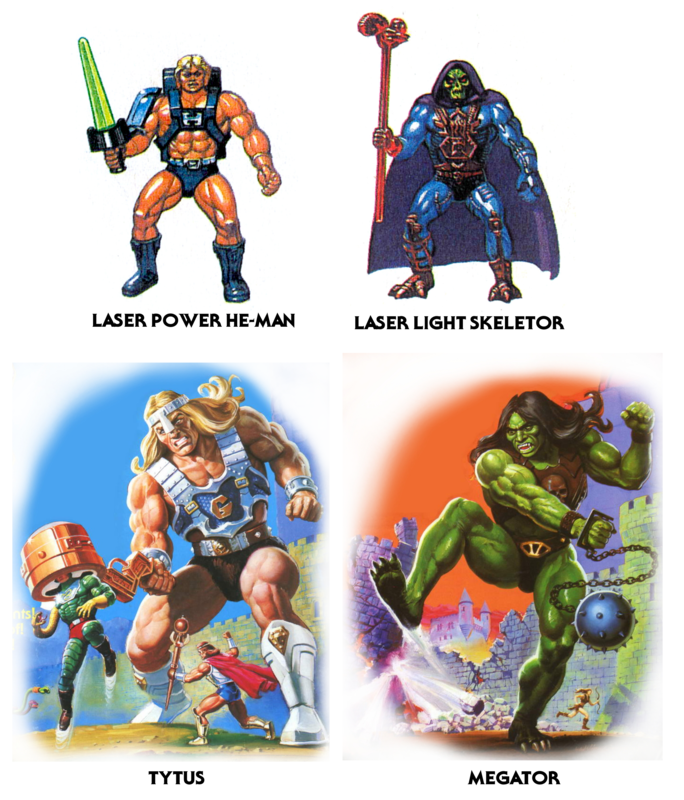 This is a comparison between the cross sell artwork by Alfredo Alcala that was featured on the backs of the first four minicomics, and the standardized cross sell artwork on the backs of the packaging. The Alcala artwork is based on some of the earliest prototype designs, but also is informed by Alcala’s own indelible artistic style. The artwork for this set comes from Axel Giménez, Tokyonever, Plaid Stallions (for the Monogram Talon Fighter), and my own scans and photos. This is not meant to be exhaustive – it merely represents the variants in US cross-sell art that I am aware of. 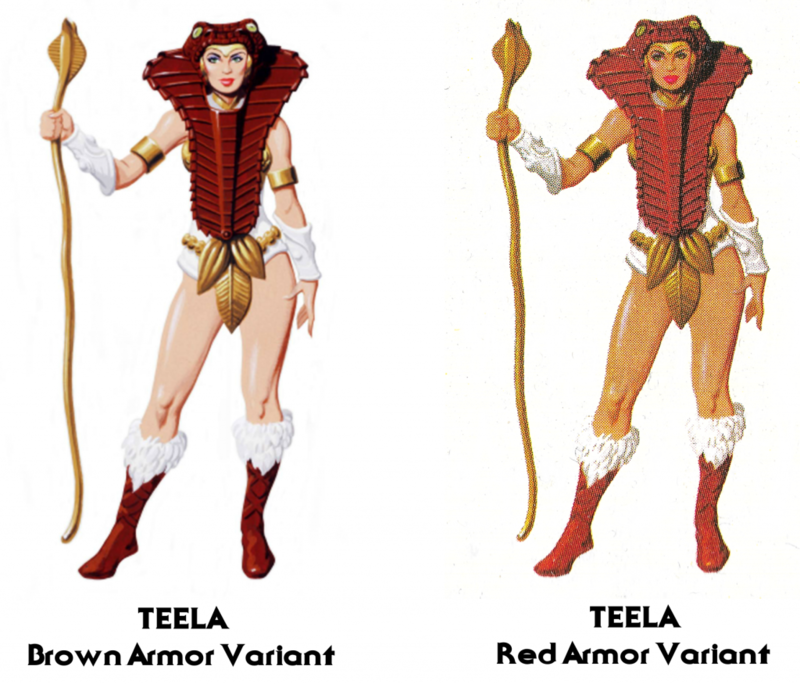 Teela shows up with brown boots and armor in the early 8-back cardbacks, but she can also be found with red armor/boots on some of the early vehicle packaging. It’s possible that this is just a variation in the way the print was set up, but the change may have been deliberate, in order to more accurately reflect the colors of her action figure. 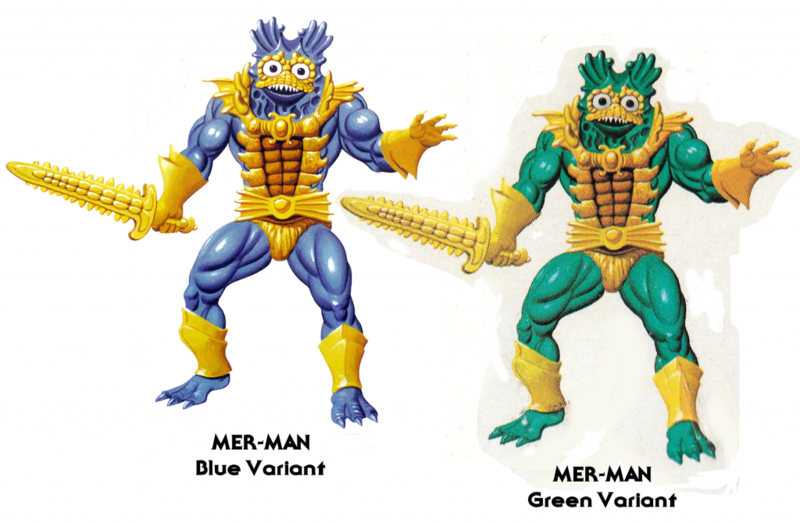 Mer-Man shows up with blue skin in early 8-back cardbacks, but he can be found with green skin on much of the vehicle packaging as well as later figure cardbacks. I believe the change was deliberate, in order to reflect the skin tone of his action figure. Of course the cross sell art still looks quite a bit different from the toy, regardless. 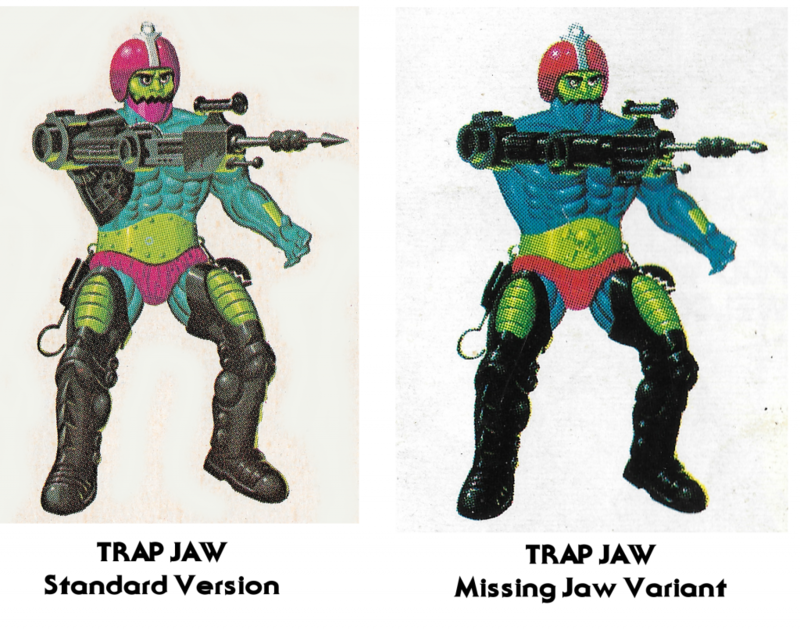 Trap Jaw’s cross sell art is something of a curiosity. It’s very common to find a version of it where he is missing not only his jaw but also his chest armor. On the other hand, only the jawless version features the skull and crossbones design on his belt. There was actually a catalog that featured a jawless version of the figure itself, making me wonder if the art wasn’t based on an incomplete sample, and the artist wasn’t aware of that fact. 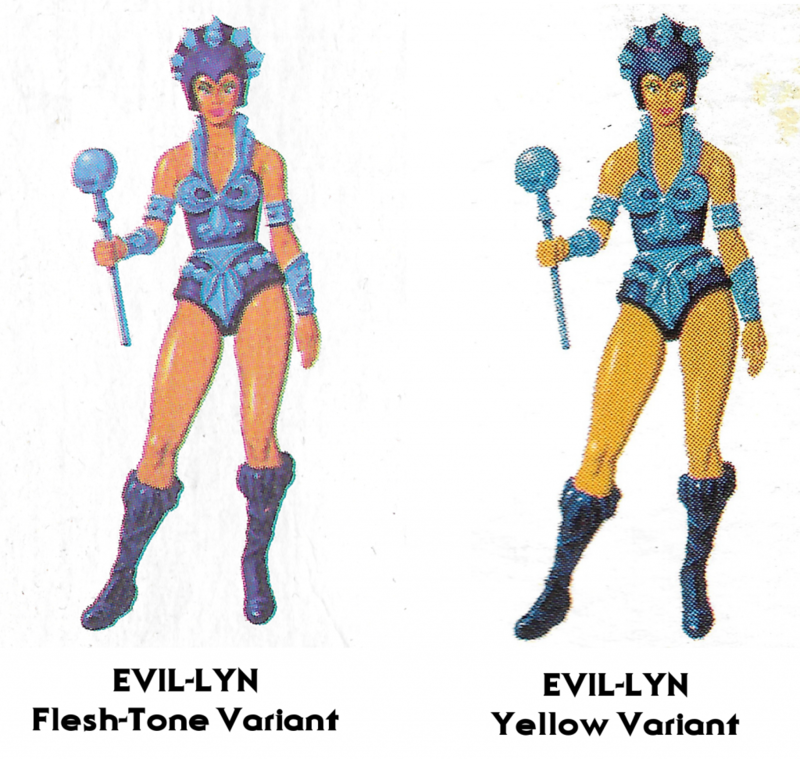 I found the flesh tone version of Evil-Lyn on the back of Dragon Walker packaging, and the yellow version on Fisto’s cardback. I don’t know for sure whether or not the change was deliberate or a printer artifact, but the flesh tone version recalls the character’s animated appearance. 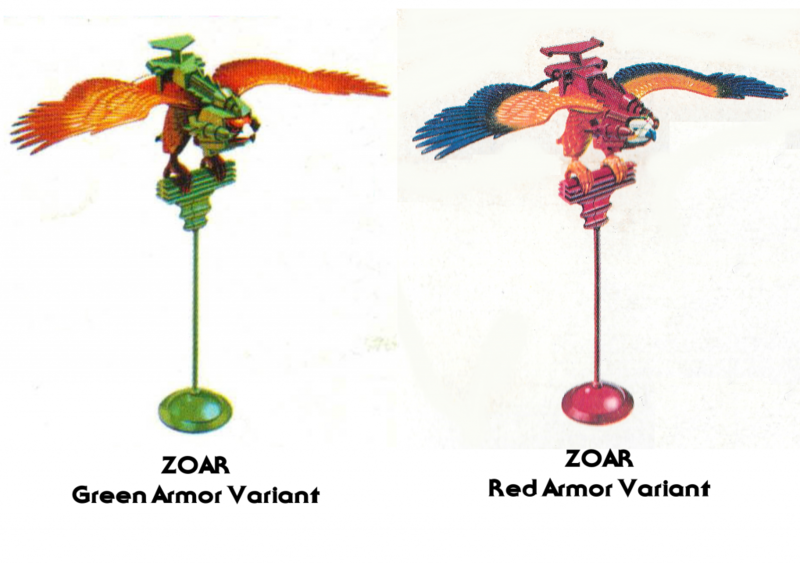 Zoar typically shows up with a two-tone orange color scheme and green armor on the backs of minicomics. Conversely, he appears in the toy-accurate orange and blue color scheme with red armor on the back of vehicle packaging. I believe the version with green armor represents and early, abandoned color scheme for the figure. 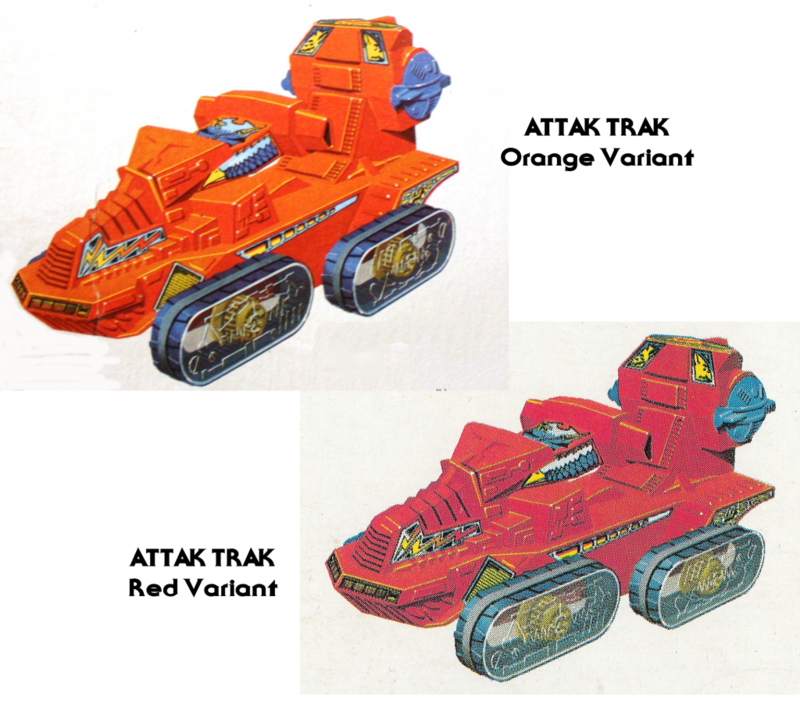 The Attak Trak variants are the most subtle of this group. The cross sell artwork appears in both orange and red. 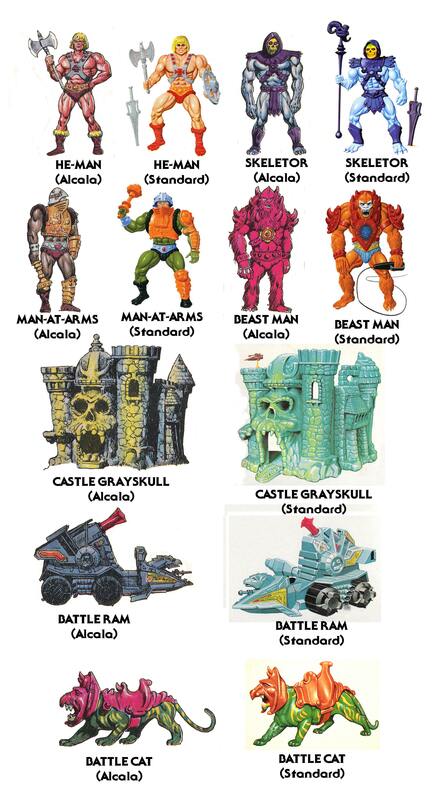 There are also some orange versions of the toy, although most are red. I believe the earliest releases are orange. 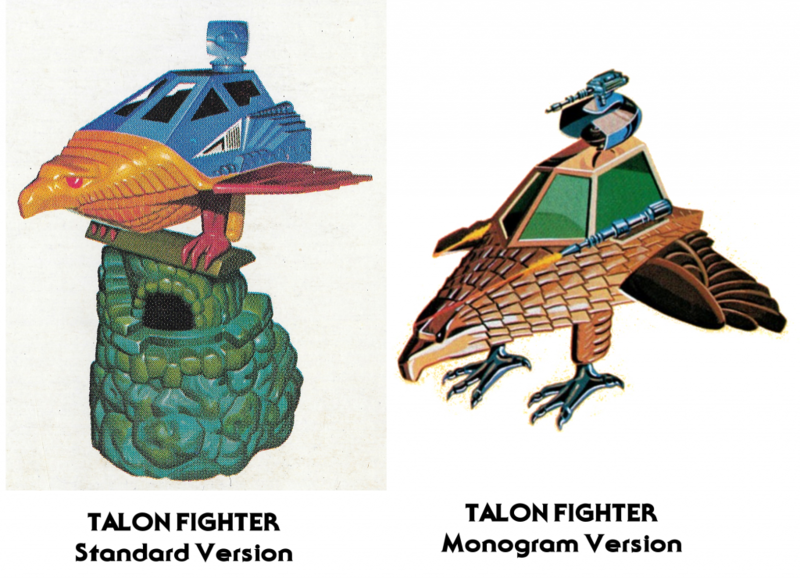 The Monogram model kit Talon Fighter looks much different than its Mattel counterpart, and so of course does its cross sell art. The Monogram version represents, I believe, an earlier Mattel design for the toy.